Think about Le Corbusier’s contemporaries for instance who thought about nature as something separated from buildings while at around the same time you had Frank Lloyd Wright talking about organic architecture that is more integrated and/or resemble nature. These are two different approaches of making sense of their views on how architecture should work and what it is for. The same is true to planning. Theory is very important if it helps to improve a planner’s understanding of what is going on. Theorists can help by making sense of a number of approaches that could be available for practitioners to use. Practitioners rarely have the opportunity to be exposed to what is going on elsewhere and this, for me, is perhaps one of the really useful things that can arise from the analysis that theorists often undertake. Having said that most planning practitioners find it often hard to understand what theorists are saying. The channels of communication between theorists and practitioners are rarely ever straightforward and open, tough. The use of language and the presentation of results is often a barrier. Theorists often have difficulty communicating in simple words the work they do. There are a few who bridge this gap though and when they do, I find their thoughts and considerations really revealing. She mentioned that David Harvey and Henri Lefebvre have done great work in the field of Urban Geography. One of the areas theorists like to look at is the input of communities into planning policy, decision making and so on. If that is the case, involving communities in planning is something practitioners experience a lot in their work. She mentioned some of the difficulties she personally experiences. How to reach everyone who needs to be reached? How much weight do we give to those who scream the loudest against the potential silent majority? How do you engage communities to discuss something as remote from their day to day lives as a 20-year strategic plan for the city? These are questions theorists might be able to help with. Theorists, because of their potential detachment from the day to day running of planning, have an opportunity to stop and think more carefully and seek to gather evidence about what planning wants to deliver (objectives) and what is actually delivering (outcomes). This can be really helpful in assessing policy performance and areas for improvement. One other question you might want to ask yourself is why I am talking so much as theorists are separate from practitioners. This is a dichotomy that might not happen in real life. “Practitioners might not be systemising what they do day in day out on paper, but they might be creating their own theories of what they do in their heads.” This statement of hers was quite interesting and carried weight. This was actually true. All of us are constantly thinking and building theories in our head and that is what we follow in our day to day lives. They become our principles at work. 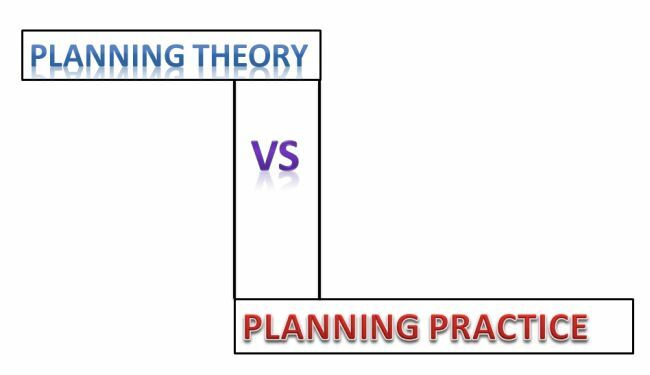 It is evident from the discussion that it cannot be said that planning theory is not relevant in planning practice. Theory has been evolving over two centuries. With new kinds of problems coming in, new theories were written. Theories were like guidance for planners. A number of theories were written addressing a planning problem of that time. This meant that planning theories were relevant for a specific period of time. They lost their relevance once the nature of planning problems changed and new theories had to be written. This entry was posted by Benzu JK on February 10, 2014, 6:28 pm and is filed under Town Planning. You can follow any responses to this entry through RSS 2.0.